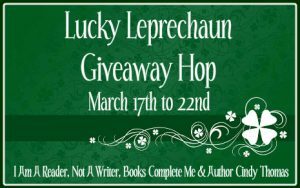 Welcome to the Lucky Leprechaun Giveaway Hop on my blog, this Hop is hosted by I Am A Reader, Not a Writer & Co-Hosted By Books Complete Me & Author Cindy Thomas site. 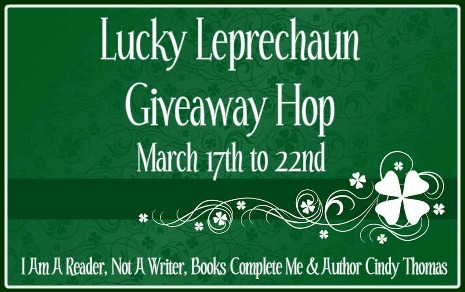 There are over 250 blogs participating in this hop, so don’t forget to check them out. The hop runs from the 17th March until midnight of the 22nd March. I am giving away a £10 Amazon gift card. All you have to do to enter is follow my blog via one of the methods on the right hand side, either email, Networked Blogs, or Facebook leave a comment saying which one and a way to contact you if you win. This is an International giveaway.